Happy Chinese New Year y’all! It is the year of the horse according to the Chinese lunar calendar and my family ushered it in with a delicious plate of yusheng (above) arranged in the shape of a horse, decorated by yours truly. Yusheng is a local salad dish found only in Singapore and Malaysia that is meant to be eaten communally with family and friends. Everyone will join in to toss the shredded vegetables loaded with sweet-sourish sauce and condiments whilst wishing for good luck and wealth for the new year. Wishing everyone a good horse year ahead horsing around! I am year of the horse 1966 and that is fire horse year (this year is wood horse). Have done some interesting research into year of the fire horse–for instance, it occurs rarely and women born during those years were shunned during the traditional matchmaking prospect. Fire horse women are said to be intractable, independent, and bring disaster to their families. Surely the bright side must be that they are beautiful and exciting, lol? Does anyone else know anything about legends of the fire horse woman? Hi, i liked the concept of using horse salad for the chinese New Year. great yaar! Hi, I’m from Vietnam. I came randomly to your blog, I saw the title of this post and I thought that I should leave a comment here. I know China is the biggest country to celebrate this New Year and most of western people still think the Lunar New Year IS Chinese New Year. No it’s NOT. It’s ok because you don’t know. But to let you know lot of other Asian people will get offended when you greet them: “Happy Chinese New Year”. The best is say: “Happy Lunar New Year”, or “Happy Vietnamese New Year”. “Happy Korean New Year”, “Happy Bhutanese New Year”… It’s a very common sense you definitely should know. Thanks and Happy Lunar New Year! Hi! Thanks for pointing that out, it surely is grossly inaccurate of me to use Chinese New Year rather than Lunar New Year. My apologies to you and wishing you a happy lunar new year! Is it translatable into some sort of recipe? However, the vegetables that goes into this recipe is not entirely the same as the ones we have in my house, but its close enough to share. 😀 Hope the link was helpful! Happy Year of the Wood Horse to you and all. 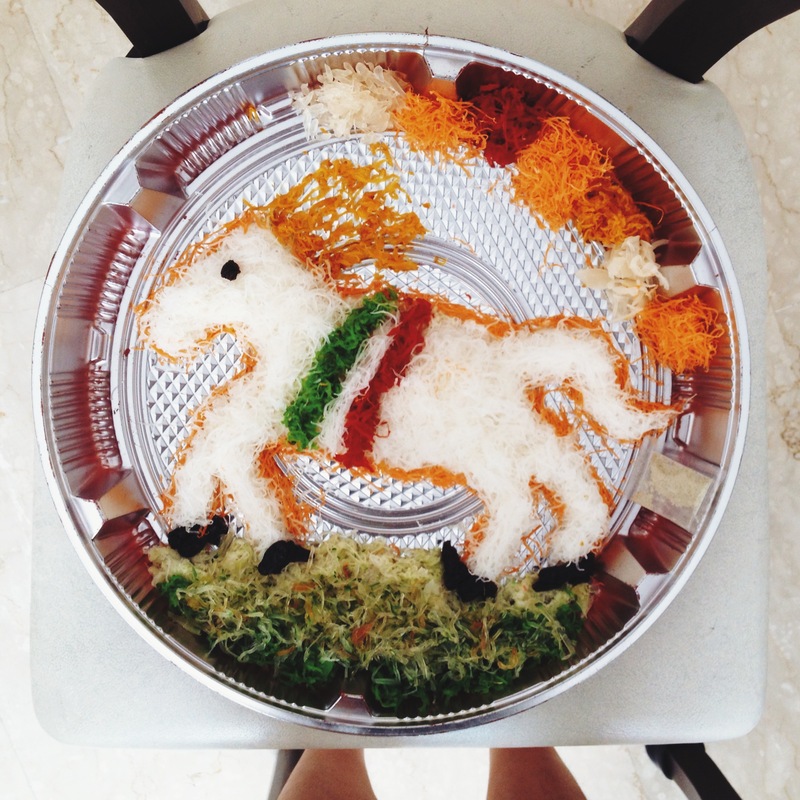 My sister lives in Singapore so sure that yusheng is part of her diet… but not with such amazing decoration.